A decade ago Latin America was the Left’s great hope. How did the dreams of the Pink Tide give way to the horrors of Bolsonaro? 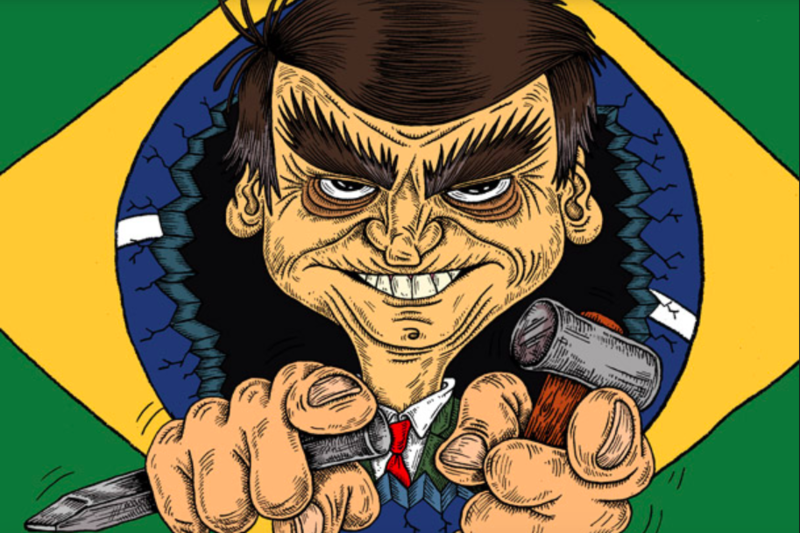 Jair Bolsonaro’s ascent to the Brazilian presidency produced much hand-wringing across the Western press. If only the conspiracy that brought him to power had been similarly condemned. The backdrop to Bolsonaro’s victory was the long persecution of the left-wing Workers’ Party, which had governed Brazil since 2003. Once Brazil’s elite had impeached president Dilma Rousseff, imprisoned former president ‘Lula’ da Silva, and banned him from running for the presidency despite his commanding lead in the polls, there was no turning back. As in Europe of the 1930s, it was the ancien régime that normalised the new monster. If Brazil offers bleak prospects for the Left, elsewhere in Latin America the picture is only a little better. The return of conservative governments has seen wave upon wave of aggressive neoliberal structural reforms. The Right has hardened its discourse, and its support base has shed the politically-correct liberal garb, in favour of a more radical — racist, classist, sexist, homophobic — language. The unregulated space of social media provides an ideal platform for this new lynch mob culture. This has been facilitated by a cynical anti-corruption politics. Latin America is the most unequal region in the world, with extraordinary wealth and poverty existing side-by-side. It’s no surprise that in this context that plutocrats flourish. But far from being the focus of the anti-corruption furore of recent years, they have wielded this political device as a means to cast the Left — the only real challenge to their concentrated wealth — as illegitimate. The preferred method for realising these aims has been a judicialisation of politics, denounced as ‘lawfare’, against progressive leaders. It is true that Latin American politicians have never taken to peaceably taking turns in power. New governing cliques have often quarrelled with their predecessors. But the argument that this latest campaign against the Left is, essentially, politics-as-usual understates the extent and scope of this current persecution. Not only are leftist leaders being brought to court on often absurd charges, but the sheer volume of accusations reveal the political nature of the attempts to put an end to historic leaderships: Lula faces four criminal cases; Cristina Fernández, six; Rafael Correa, fifteen. Their sympathisers and former comrades have been the subjects of witch-hunts on an unprecedented scale. Latin America’s corporate media has played its part, as it always does, in campaigning against the Left. For years it has filled bulletins with story after story alleging corrupt activities by left-wing officials. Regardless of whether specific cases eventually prosper, the coverage sullies the legacy of the Left and propagates suspicion. This daily drumbeat of accusation has helped to provide new right-wing rulers with an aura of renewal and legitimacy; they can, magnanimously, claim that the matter is strictly judicial. Lawfare therefore plays an important social function. It has become one of the most important pillars of re-establishing an order threatened by left-wing reformers and plays a key role in softening popular resistance to the new elite pacts and their ensuing neoliberal adjustments. The aim is not only to banish leaders, but also to erase the past. Time will tell whether elites are successful at constructing the historical narrative they have chosen, or whether collective memory, notoriously slippery and unruly, escapes their control. This desire to erase the legacy of the ‘Pink Tide’ — as it was known in English — demonstrates the threat these left-wing governments posed to Latin America’s ruling class. They weren’t a monolith, of course, and were characterised by varying degrees of radicalism and different ideological emphases. But in general, the period saw a modernisation of society, institutions, and the economy. The Left orchestrated much-needed redistribution and fought decisively to ascertain greater sovereignty in a region historically overshadowed by successive global powers. The leftist governments carried out these reforms with greater caution than in previous statist experiments. They made sure to steer away from the mistakes of import-substitution industrialisation (ISI) in the 1950s–70s and the debt crisis and hyperinflationary problems of the 1980s which left an indelible mark on Latin American economic thought. With the notable exception of Venezuela, there were no hyperinflationary processes in Latin America during the Pink Tide. Even Argentina’s high inflation did not compare to what would have been considered problematic thirty years earlier. In fact, it is under Mauricio Macri’s neoliberal government that inflation has significantly worsened. For most of these progressive governments, reforms were accompanied by important remnants of orthodoxy. Governments avoided major macroeconomic difficulties, did not solve their deficits by endlessly printing money, and kept their foreign debt under control. But, beyond its macroeconomic prudence, the Pink Tide proposed a post-neoliberal model of development that strongly departed from the notion that the market was the solution to all of society’s problems. The economic policies it introduced, especially where these were successful at stimulating growth and ameliorating social ills, set an important precedent. They demonstrated that opposing austerity was not only more socially just, but also more economically intelligent. Bolivia quadrupled its Gross Domestic Product (GDP) in twelve years. Ecuador doubled its own GDP in eight years and quickly overcame the great commodities decline of 2015–16 by carrying out anti-cyclical measures that successfully protected the most vulnerable sectors of society from the recession. The Left in power in Latin America provided a real-life contemporary exercise in debunking neoliberal myths. This was never going to go unopposed. The campaign to criminalise the Left in Latin America is a backlash against the political success of a post-neoliberal project that dared to challenge a decades-old social order. A politics of social and economic intervention in the interests of the majority was always irreconcilable with the culture of Latin American elites. Much has been written about the ill disposition of the region’s capitalists to change or innovation and their conformity with the role ascribed to their countries in the international division of labour. Latin America’s political class has been notoriously incapable of carrying out strategies to develop their own economies by transferring part of the capitalist surplus to productive investments in other sectors of the export and non-export economy. Too consumed by their immediate concerns for political survival, pre–Pink Tide governments preferred to avoid confrontation with elites, who thus became unaccustomed to the very notion of compromise, which is crucial to the creation of a sustainable social contract. They were never going to take kindly to the Left’s resort to state planning, a regulatory agenda, and the introduction of ‘carrot-and-stick’ public policies aimed at changing social and economic behaviour. But it would be wrong to suggest that the Left’s problems in Latin America were only the result of elite revanchism. In recent years, progressive forces have faced a new and unexpected political foe: the middle class. The Pink Tide governments empowered this stratum, which had been squeezed by the growth of inequality in the 1990s. Research done by the United Nations Development Programme shows that, between 2000 and 2012, 90 million Latin Americans were lifted out of poverty to swell the ranks of the middle classes. Yet, today, few display allegiance to the politics that improved their condition. This odd phenomenon has been a source of much preoccupation and debate inside the Latin American left. Why did a social group that benefitted so much from progressive policies turn so sharply against the Left? A key to answering this question is the shift in identity: the new, aspirational middle class ceased to identify itself as poor. In redefining its sense of self, the middle class distanced itself from its social origins which, in turn, resulted in a disaffection with the leftist ‘parties of the poor’. It is clearly a benefit of redistributive policies that people lifted out of grinding poverty can aspire for more from their lives, but it is the Right and not the Left which tends to own the discourse of aspiration. In Latin America progressives were too slow in coming to terms with this phenomenon. Only in a few countries did the Left actively and politically accompany this transition from paucity to opportunity with an ideological project. Most leftist parties stuck to the liberal rulebook: their priority was campaigning, winning elections, and providing public displays of political strength through mass gatherings and pro-government demonstrations. Aside from the tireless pedagogical exercises of charismatic leaders, social mobility mostly followed its course without an accompanying narrative that made sense of it politically. Into the space unfilled by the Latin American left arose a new age of social media, with the emergent middle classes becoming immersed in Silicon Valley’s nexus of communication. A form of digital colonialism emerged. Its Western consumerist content clashed directly with the narrative being relayed by the Left, but its aesthetics and ideology were perfectly suited to the region’s rightward drift. But it wasn’t only on the right where the rise of social media had an impact. An array of politically marginal — but sometimes intellectually influential — critiques from the Left brandished anti-capitalist arguments to discredit the Pink Tide governments, underestimating both the importance of our anti-neoliberal project and the threat posed by right-wing restoration. Combatting neoliberalism has been a difficult ideological struggle, especially with the influence that corporate interests exercise through the media in establishing economic common sense. The Left has had to fight tooth and nail to defend its model of public investment, endogenous growth, and a transition away from productive specialisation. But not every battle appeared like the revolutionary confrontations of the Left’s imagination. Many of these struggles reflected much more mundane concerns of economic sustainability, such as tax reform, the nationalisation — or recuperation through other means — of natural resources, and debt renegotiation. Transnational capital made sure to punish any deviation from their script. International arbitration courts, within the confines of bilateral investment treaties, hurt leftist Argentina, Bolivia, Ecuador, El Salvador, and Venezuela. That process demonstrated how little the domestic bourgeoisie valued sovereignty: when governments denounced ‘illegitimate’ debts, Latin American elites echoed the international condemnations. In part, this is because many international creditors were also local plutocrats, speculating in the markets on the back of their own countries. Argentina’s fight against the vulture funds in the United States was fraught with this logic, as was Ecuador’s debt renegotiation. The Latin American equivalent of a Rooseveltian New Deal, with high public investment and a push for the construction of infrastructure, entailed big contracts for roads, schools, hospitals, universities, hydroelectric dams, ports, airports, and connectivity of all sorts. If financial speculators were never allied to progressive governments, certain entrepreneurs, particularly in the construction sector, held their peace. But the commodities crash after 2014 changed that too. Public investment slowed down. And the general economic downturn pushed many elites who had accommodated to the new politics to adopt a more hostile approach. But, of course, the Pink Tide did not recede only because of domestic factors. There were geopolitical elements of this right-wing counter-attack. The synchronisation of actions, discourse, and strategy is too blatant for this sudden and overwhelming regional restoration of traditional power to be a mere sum of isolated events. One day, declassified documents full of evidence on the role played by the United States will surely surface; they always do. Barack Obama was patient and affable on the surface, but he exerted constant pressure on regional progressive governments from the first day of his presidency. His administration reactivated the presence of the Fourth Fleet in Latin American waters and significantly increased the number of military bases in Colombia, which became the first Latin American NATO partner in 2017. Obama warmed to Cuba on the one hand — believing the embargo was an anachronistic policy that would not achieve the island’s transition to capitalism — but declared Venezuela a national security threat on the other. As in so many other areas, Donald Trump has been worse, reversing the thaw in relations in the former and imposing sanctions on the latter. The attack against the Union of South American Nations (UNASUR) aptly illustrates the kind of realignment we are witnessing in the hemisphere. As an integration project, UNASUR was grounded in strategic political realism. Governments of all political shades attempted to consolidate a block of states that would converge on social, political, economic, and security issues. But in April 2018, six states (Argentina, Brazil, Chile, Colombia, Paraguay, and Peru) of the organisation’s twelve suspended their memberships. For the United States, an integration mechanism capable of providing a South American alternative to the Organisation of American States was always going to be unacceptable. UNASUR, even if not avowedly anti-imperialist, sought to put an end to the Monroe doctrine that saw Latin America as the United States’ ‘backyard’. The assault against the Left in Latin America has been vicious. And for all we know, it may be just beginning. On the other hand, we should not underestimate the Left’s capacity to regroup, maintain political relevance, and reclaim government. Twenty years ago, the Left was in tatters in most parts of Latin America; it was a marginal and fragmented force with, at best, single-digit results in national elections, usually lagging behind several right-wing parties contending for political power — Lula’s successive presidential runoffs being the big exception. Today, the Left is the main opposition force in many Latin American states. Its recent victory in Mexico, an important regional powerhouse, confirms that collective aspirations for social justice is still a driving force in Latin American politics. It will take hard work, patience, and, where it has waned, a renewed engagement with popular demands and social movements. But when this happens, the latest wave of reaction will be overcome. Progressive forces have suffered many defeats in the history of Latin America — but none of them have been final. It will play a leading role in global struggles again before long. Guillaume Long served as Foreign Minister of Ecuador under the government of Rafael Correa and was the country’s Permanent Representative to the United Nations until January 2018. He is now associate researcher at Institut de Relations Internationales et Stratégiques (IRIS) in Paris, France.